Leeds United failed to end their month long wait for a win, but their weakened team battled to a goalless draw at Hull City. Much maligned goalkeeper Felix Wiedwald emerged as the hero with a number of quality saves as Thomas Christiansen’s men had to cope with more adversity. 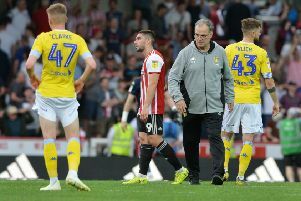 There was no red card this time, but Leeds added injury woes to their suspension worries after losing two defenders before five minutes was out at the KCOM Stadium. After losing Matthew Pennington in the build-up to kick-off they then lost his replacement, Conor Shaughnessy, when he had to be carried off in the fifth minute. With no centre-backs on the bench, Gaetano Berardi switched to the middle of defence with Stuart Dallas coming on to play right-back. The Whites had already taken the field without injured Luke Ayling and four players sitting out suspensions so were depleted and it could be no surprise that they never really got going in the first half. Only a string of saves by keeper Wiedwald kept United in the game along with some misses by their hosts. Hull’s first chance arrived after only three minutes when Fraizer Campbell was off target with only Wiedwald to beat. Shaughnessy was injured in trying to stop the home striker and had to leave the field. Wiedwald came to the rearranged defence’s aid when he saved Jarrod Bowen’s powerful shot then produced a fine stop to tip a low effort from Nouha Dicko wide. The German keeper Wiedwald came to the rescue again to save with his legs to deny Jackson Irvine. United finally showed some attacking intent as captain for the night Pablo Hernandez put in a dangerous cross and saw a shot from distance deflected wide. Hull did have the ball in the net, but Dicko was adjudged to have fouled Wiedwald. The Leeds keeper ended the half with another save to deny Bowen and it remained 0-0 at the break. In the second half Leeds initially had more of the play, but Hull missed a great chance when Dicko fired over from inside the six-yard area. Wiedwald saved a Kamil Grosicki long shot before Hernandez was off target with a shot from the edge of the box after being set up by Pierre-Michel Lasogga. A spate of Hull bookings for fouls showed how much United were more in the game and Lasogga came close to scoring with a curling shot from 25 yards out that went narrowly wide. A great chance followed when Ezgjan Alioski found space in the area only to scuff his shot. Alioski did better with a shot from outside the box soon after, but the ball just cleared the crossbar. Hull piled on some late pressure, however, with Michael Hector heading over from a corner and Campbell only denied by a superb save from Wiedwald. Five minutes of injury-time were to follow, but Leeds held out for a draw, which in the circumstances was not an awful result - but they have failed to win in January and are fast falling out of the running for promotion. Hull: McGregor, Aina, Dawson, Mazuch (Hector 69), Tomori, Larsson, Henriksen (Grosicki 45), Bowen, Irvine, Campbell, Dicko (Keane 72). Subs: Marshall, Hector, Grosicki, Toral, Evandro, Keane, Clark. Leeds:: Wiedwald, Berardi, Shaughnessy (Dallas 5), Jansson, De Bock, Forshaw, Vieira, Alioski (Sacko 86), Hernandez, Roofe (Cibicki 90), Lasogga.